Is yeast the new hops? 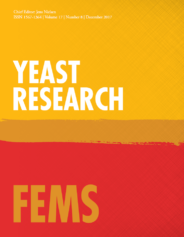 The leading journal in its field, FEMS Yeast Research bridges the gap between pure and applied research on conventional and non-conventional yeasts and yeast-like organisms. In recent years we have seen a revolution in brewing and beer drinking. An industry once dominated by a small number of mega brands has shifted so that bars and retailers across the world are offering a seemingly endless variety of beers produced by craft or speciality breweries. In the midst of all this new variety a key characteristic has been hops. This ingredient contributes the bitterness and much of the aroma to beer and brewers appear to be in a constant battle to produce the most bitter and exotically hoppy beer possible. This is perhaps an understandable reaction to the era of bland lagers that were differentiated more by their marketing campaigns than any clear difference between the products. But what now? Have we reached peak hoppiness in the beer market, and is further diversity even possible with the number of products on the market? The signs are that further development is possible and indeed underway, though perhaps from an unlikely source. The humble yeast, the workhorse of the brewing industry, is beginning to receive the recognition that it perhaps has been missing. The brewing industry has traditionally relied on consistency to maintain customer loyalty. Breweries were proud to declare that they have been using the same yeast strain for generations. Even some craft brewers still view yeast as simply a means to an end; as long as the fermentation is completed there is no problem. However, the role of yeast is much more interesting and varied than that of a simple alcohol factory. During fermentation, yeast produce a range of aromatic compounds that give beer its characteristic flavour and vivacity. The next time you drink a wheat beer, remember that the prominent spice and banana flavours come not from barley or hops, but directly from the yeast. Yeast also removes the raw grain-like taste of wort, the syrupy malt extract from which beer is derived. The burgeoning interest in yeast has been inspired by a realization that yeast is not just one thing. There are specific strains for specific products: wheat beers, bitters, lagers, etc. And it’s not just strains of one species. The complex and funky flavours in Belgian lambic beers, for example, are due to a consortium of different yeast species all lending specific flavour notes during the long lambic fermentation process. This relationship between yeast complexity and flavour complexity has been appreciated for some time in the wine industry, where the presence of different yeast species is encouraged and often facilitated by winemakers. This attitude is however still new to the brewing industry. We know of over 2,000 different yeast species, though only a handful have ever been used for brewing. However, even this small number has produced interesting flavours. Yeast with exotic names like Torulaspora and Kluyveromyces, for example, are known to produce distinct flavours of bubblegum and rose. Another yeast, Lachancea, adds a crisp acidity to beer, along with pleasant fruit aromas. With the aid of such yeast a brewer can generate innovative flavour profiles, completely naturally and without resorting to artificial flavourings. Such bioflavouring is perhaps most important in the production of low alcohol beers, which are often derided as lifeless and flat, an unfortunate consequence of fermentation processes that discourage yeast activity to limit alcohol production. Many non-traditional yeast are perfect for the production of low-alcohol beers due to their inability to utilize the complex sugars in brewer’s wort, while still producing typical beer flavours. S. cerevisiae, differential interference contrast image by Masur. Public domain via Wikimedia Commons. By far the most commercially important brewing yeast is the one that drives the lager brewing industry. 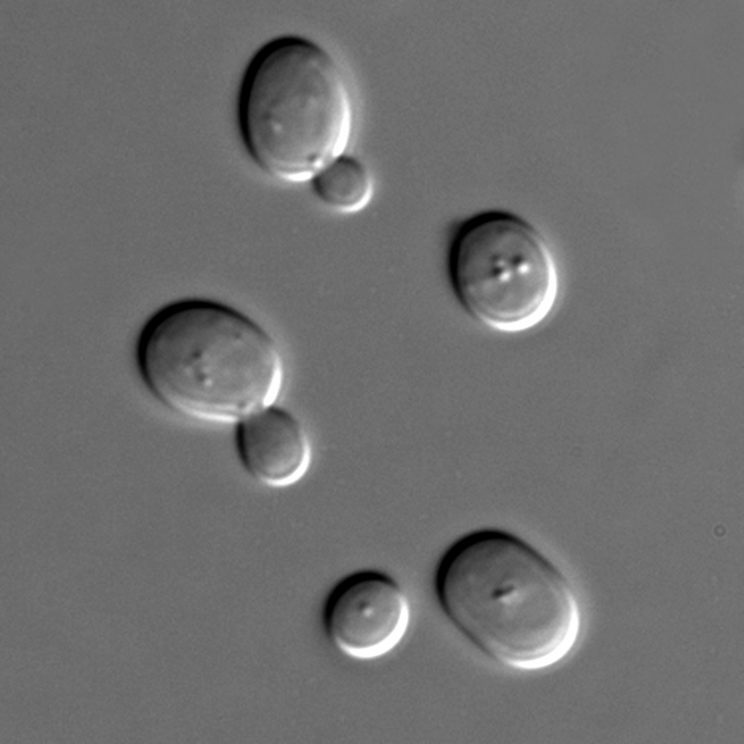 This yeast, Saccharomyces cerevisiae is unique in that it combines two features that are rarely seen in the same species: ability to convert the complex sugars in wort to alcohol, and the ability to do this at low temperature. This latter feature is crucial as the crisp freshness of lager beers requires a cold fermentation. The uniqueness of this species stems from the fact that it is in fact not a true species, but rather a two-species hybrid – in effect, more of a mule than a workhorse. The two species involved, S. cerevisiae and S. eubayanus provide, respectively, good fermentation tolerance and ability to withstand very low temperatures. Without the happy marriage of these two species, lager beer as we know it would not be possible. How the two parental species originally united is still a matter of debate. The S. cerevisiae parent was almost certainly an ale strain and the S. eubayanus probably a contaminant in the original fermentation. Though, curiously, S. eubayanus has never been found in Europe (the birthplace of lager beer) and appears, rather, to be a native of South America and Asia, raising the question of how it found its way to Central Europe to kickstart the lager brewing industry sometime around the 15th century. Whatever the reason, it was an unexpected and rare event that may have only happened once or twice in history. Essentially, lager brewers have been using the same one or two strains for centuries – perhaps one of the reasons for the aforementioned sameness of lager beers. This situation has now changed with the recent discovery of S. eubayanus, originally in Patagonia, but later in other regions. Once the absentee parent had reappeared, it became possible to artificially recreate the historic hybridization event that originally led to the emergence of the lager yeast. This has now been done by labs in Belgium, Finland, the Netherlands and elsewhere, greatly increasing the number of new strains that can be applied in the brewing industry. Blandness is no longer an issue; lager yeast with specific traits can be obtained simply by choosing parents with the required properties. Some of the new strains even appear to be better at fermentation than the natural hybrid yeast that has been utilized for generations. The hunt for S. eubayanus in Europe continues and its location will surely shed light on the complex family tree of brewing yeast. In the meantime it has been realised that many Saccharomyces species are, like S. eubayanus, cold tolerant. Also, like S. eubayanus, they have little ability to ferment wort. However, when hybrids are created by mating ale yeast with some of these alternative species, the results have been surprisingly good, with some of these alternative hybrids even performing better than the S. cerevisiae x S. eubayanus hybrids. There is now the opportunity to make new lager yeast hybrids with the aid of local wild species. The majority of these new species have never been used in any biotechnological process and similar attempts could be made to take advantage of the phenotypic properties of other ‘wild’ yeast. These could include all the processes that involve yeast fermentation: baking, soy sauce, wine, kombucha and cider fermentation, even production of bioethanol or commercially important chemical precursors. A spirit of experimentation in the brewing industry has inspired a fresh look at what can be achieved by studying the basic biology and biogeography of wild yeast and may yet lead to many more new and important innovations that could be applied in a range of industries. Featured image credit: Beer before meal by Jakub Kapusnak. CC0 Public Domain via Foodiesfeed. Brian Gibson is a Principal Scientist and Project Manager at VTT Technical Research Centre of Finland, Ltd. where he has worked since 2009. His research work is mainly focused on the biology of brewing yeast and how this impacts on fermentation performance and beer quality. Current topics of interest include improvement of yeast performance through hybridization and/or adaptive evolution as well as optimization of process conditions. The underlying mechanisms (genetic, molecular, physiological) that govern yeast performance are a particular interest. Brian’s group is also actively engaged in projects related to other fermented and distilled beverages, bioethanol and baking. Brian was awarded his PhD from University College Dublin in 2004, after which he carried out brewing research at Oxford Brookes University and the University of Nottingham. Brian is also a coauthor of "New yeasts—new brews: modern approaches to brewing yeast design and development", recently published in FEMS Yeast Research.